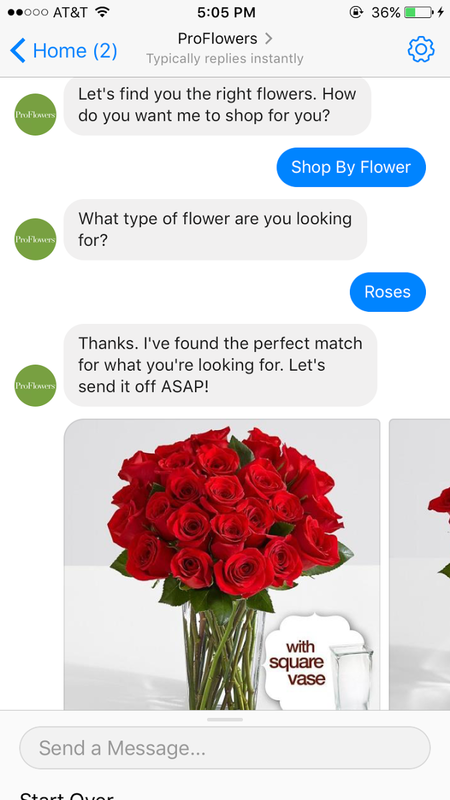 ProFlowers now has a chatbot on Facebook Messenger with capabilities that include a one-click "Buy" button for holiday shoppers, according to mode.ai, the company that developed the chatbot for ProFlowers. The retailer’s Virtual ProFRESHional chatbot is the first one designed by mode.ai to include a one-click purchasing feature, a capability that resulted from the company’s partnership with Facebook and the social media giant’s effort to enable new capabilities for chatbots using its Messenger platform. The ProFlowers chatbot uses artificial intelligence and natural language processing technologies to support multiple other features, such as quick transfer to a human customer service representative when needed, and social sharing, among others. The one-click buying capability means that ProFlowers' more than 417,000 Facebook followers can purchase items quickly in Messenger without being directed to the retailer's web site. That's a capability most chatbots have lacked up to this point and an important one to reduce friction in closing a sale through a chatbot. ProFlowers' chatbot includes one-click buying, a capability many chatbots lack. That's a competitive edge for ProFlowers right now, but it sounds like other retailer chatbots — at least others working with mode.ai — will soon join the club. Eitan Sharon, founder and CEO of mode.ai, told Retail Dive in a phone interview that previous chatbots the company has created, for Louis Vuitton and Levi Strauss among others, are likely to get the one-click buy button added to their existing chatbots. "Everyone will be getting this capability soon," Sharon said. "There will be other new features supported eventually, too, like a frictionless click-to-dial capability." If the latter months of 2017 prove to be any indication of what's to come, we are likely to see many more retailer and brand chatbots coming out in 2018. Sharon said recent months have seen a migration in retailer attitudes about chatbots from casual interest to firm decisions to implement them. Though brands like Louis Vuitton and ProFlowers may have been aiming to time launches with the holidays, that's not the only factor in recent chatbot developments. "Earlier this year, there may have been a casual interest, but now it's getting to where there's a sense of urgency among the C-level people at these companies to make the decision to get it done," Sharon said, adding that the new converts have seen enough existing chatbots work that they are ready to join the movement as "fast followers." For some retailers, competitive factors also might be playing a role in their decisions. For example, ProFlowers' chatbot introduction comes a year after 1-800-Flowers adopted its own Facebook Messenger chatbot and an AI-powered gifting concierge. Despite their growing popularity, chatbots are not necessarily slam-dunk successes just yet. One recent study suggested as many as 60% of retailers have yet to use chatbots to communicate with customers. But, smoothing and accelerating the path to purchase with something like one-click buying certainly will give more retailers a reason to give chatbots a try.